personal | Science, I Choose You! I didn’t imagine blogging becoming part of my life. I never thought so many people would read my posts in the past year. Never anticipated the number of my twitter followers would grow from the 24 people I actually knew, to the 350 people whom I became friends with. I never imagined finding a place I belong and becoming a part of the online community for science communication. I didn’t realize blogging would make my voice a little louder, my imagination grander, and my stance for what I think is right much stronger. I didn’t think that with all the random thoughts I have, thoughts connecting my life to science, to research, to the society, this blog becomes me, and I become the blog. I once told a friend that I wrote my blog posts like my diary. This is about half right – the other half, I wrote them like my research thesis. With every comment posted by others, my heart beats somewhat faster. Whenever a friend says “hey I read that post!” A smile floats to the surface – it’s a rush. I want to thank the friend who practically pushed and shoved me into blogging and twitter. The friends who watched me”grew up” online. The friends who contributed ideas, many of which became actual posts on this blog. And the friends who read my blog. All of you whom I have met, or I haven’t met and hopefully will meet and chat in person one day. Thank you, you are awesome. Last but not the least, I would like to give myself a little pat on the back. Theresa, thanks for being the stubborn idiot who thinks that you have more than 24 hours a day and isn’t afraid of making some mistakes here and there. Thanks for wanting a little more. Thanks for saying no when you should, and saying yes when you really shouldn’t. Last weekend there was a free screening of James Balog‘s film “Chasing Ice” here in Vancouver, organized by SFU’s Vancity Office of Community Engagement and the Environmental Youth Alliance. I only just read about James’ project in National Geographic’s 125th Year Special Photo Issue last week (lucky! ), so this movie immediately went into the Saturday night spot in my calendar. The movie focuses on the Extreme Ice Survey project that James started. The idea is to document the changing glacier landscape using time-lapse photographs. While the idea seems simple enough, the execution is hardly the case. Just imagine carrying all the camera gears, some of which you have to build yourself because they don’t exist yet (not built for extreme weathers or long duration without care), climbing hours in -40C weather, and checking regularly to make sure the cameras are taking photos instead of being knocked down by falling rocks or having their wires chewed up by wolves. They also lost the first few months because of malfunction timers, so they ended up making a few extra trips in order to replace all the timers. This is not to mention James had several knee surgeries done in order to complete the project. Yup, that’s what they did. But the results were astounding. While you might not understand statistics or mathematical models, one thing you can clearly learn from his photos is that our climate is changing, the glaciers are disappearing, and at once we can really grasp what climate change means. All that ice must be going somewhere? And that is a consequence we can envision. Through nearly a million time-lapse photographs, we now have indisputable, gut-wrenching proof that ancient glaciers are disappearing…The photographs show glaciers breaking apart and melting faster than we had imagined. Interestingly, James actually has a background in research, with a graduate degree in geography and geomorphology. He admitted in the movie that he was not so keen on the numbers and statistics associated with research work. However, it appears that he developed photography skills while he was working on his master’s degree, and eventually found passion in documenting humans’ interaction with the natural world. To me, it is clear that his research background supplemented him tremendously in his photography work as well as the Extreme Ice Project, making his photography a work of art and science. In fact, his story is familiar one for me. When I was working on my PhD, I found myself drawn to chatting with and writing to people about science instead of my *actual* research work. In fact, it was during this time that I got better with writing grant applications, editing people’s work, and planning outreach events. It took a while for me to make up my mind not to stay in research, by which time I was already half way into an expedited PhD program and finished my comprehensive exam. I then did something unthinkable (my boyfriend at the time went “you did WHAT?”). I called my supervisor and transferred myself out of the PhD program to complete with a master’s instead. Do I ever regret it? Maybe a tiny bit, once in a while, when many of my friends from graduate school are now being called Doctors. But that regret goes away oh so quickly because I love my job so much, and I know that for some friends, I have the dream job that they want. I could not imagine what would have happened if I didn’t take that step to do something about it. My point is – regardless of whether you are working on your master’s degree or your PhD, your life is really, well, your life. While there are many talks about the lack of academic positions for the number of graduate students we are training, or whether going to grad school is worth the time and the money, perhaps ask these questions instead: Do I really need a PhD to do this? Do I really want an academic career? Can the skills I develop during grad school help me do something I love? And, don’t doubt the value of what others might consider “lost years” if you don’t end up with an academic career. James got really good with photography, and I had plenty of opportunities to work on my writing and event planning, all during graduate school. In fact, now that I think about it, there is so much flexibility in graduate school that it probably is the best chance to spare some time and do something you love. I guess that is why James Balog was chasing ice, and I am now writing/talking science. That’s why we don’t let our degrees define what we want our lives to be. On the topic of making your life an adventure, check out Terry McGlynn’s great post On creating your own path through life. 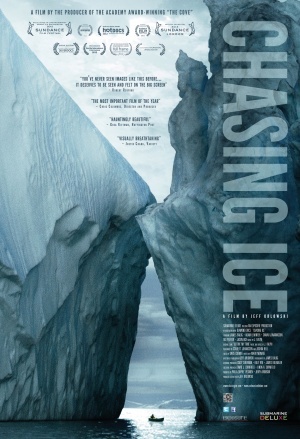 And, regardless what your attitude toward climate change is, I highly recommend that you check out Chasing Ice. For the story, for the striking imagery, and for potentially the last evidence of our glacier that might disappear in our life time. 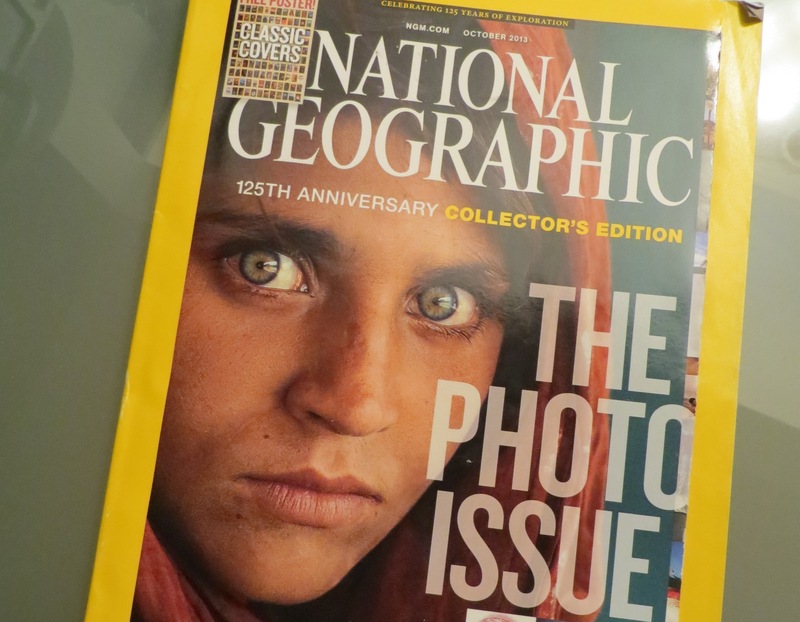 I spent much of my last Friday evening reading the National Geographic’s 125 year special photo issue. Photography has a special place in my heart for many reasons. My grandpa used to own a camera shop, and I grew up playing with manual SLR cameras with my mom. I am also a rather nostalgic person – just ask the random typewriter I bought because my dad used to own one and I grew to like the “ta-ta-ta” noise. Interestingly, I have often been in the position of archiving – even now, my job involves archiving some of my department’s documents and photos. While my photography skill probably falls short, and I really don’t have the time or finance to support a photography hobby, photographs can connect me on a level that words or moving pictures sometimes can’t. The photo issue has several great stories – from conservation, glacier, to mixed-race identities. The one that hit me the most was the story about Congo. The situation in Congo is not new. While the country is rich mostly because of metal mines – gold, tantalum, tin, tungsten, and more (check your cell phone – some of the metal components probably came from Congo), it has been in much tension and conflict. Many mines are owned by warlords; they enslave people to harvest the metals in poor conditions, and then use the money to finance weapons in order to maintain control over the slaves. Despite some major electronic companies putting pressures on the government to do something about it, and the recent defeat of M23 is definitely good news, but there is still a long way to go. I cannot include the National Geographic photos here, but I have embedded below the Flickr album from the Enough project. The reality is that such situation did not arise in one day. Often times there are complicated historical and geographical reasons. Geographically, the Democratic Republic of the Congo is the 11th largest country in the world. Culturally, it suffered from colonization, insurrections, invasion, and so on. It is when it comes to international issues such as these that I feel extremely helpless – Me, a professional women with a job and a voice, yet there is not much I can do about it. Once in a while, a celebrity will come on TV to raise some awareness, and this is in the limelight for a few days, and then people forget about it…over and over again. Something else I realized was how National Geographic photographers consider themselves as having dual responsibilities. On one hand, they take photos for commercial reasons. On the other hand, many of them strive to bring awareness to the issues that they care about. This reminds me that scientists often have duel responsibilities too. On one hand, we are hired – either by academic institutions, by the government, or by the industry – to conduct experiments and run activities that technically should advance the agenda of the organization. On the other hand, many of us feel that we have a responsibility to the society, especially those of us who really love our jobs. Just like photography is more than simply capturing the moment, sometimes science is really more than just experiments and lab reports. Our science is our cameras and the results are our photographs. There is so much at stake here – our health, our environment, our future. I am so sorry, readers…I have been trying to write part 3 for my series on how to study gender bias in science for the past 3 weeks. In fact, my vacation from work started 2 weeks ago, so I had plenty of time to do it! At least that was what I thought to myself. But I made the same mistake that many people made, thinking that they will continue to be productive work-wise on their vacation, only to realize that this is not the case afterward. And to top it off, now that I am not “at work”, I miss the environment of constantly being part of the science communication conversations at work. These conversations push me to write about issues, to think about the next article, and to voice concerns. Now that I am not in that environment, it is very hard to move past my writer’s block. Anyways, I am been carrying the guilt of not writing up part 3 and 4 of my series, but at the same time I would much rather take a proper break and make sure that when I come back to complete my series, the articles will be the best they can be. So, sorry readers. But don’t worry. My vacation ends in 2 weeks so you should find the series on my blog fairly soon 😀 Thank you again for your support and please do continue following this blog in the future!